Driving from Berlin to Belgium, a short detour will bring you to a castle just a short distance from Bonn and Cologne. Drachenfels (Dragon's Rock) refers to the medieval ruins at the top of the peak, but there is also a modern and impressive interpretation of a castle three-quarters of the way up the slope. Siegfried, the hero of the Nibelungenlied, is said to have slayed the dragon Fafnir here and bathed in its blood to become invulnerable. The history alone is enough of a reason to visit. The fortress' history began as a defense from attackers to the south. Arnold I, the Cologne archbishop, ordered its construction from 1138 to 1167. But the fortress' development was undone in 1634 when an archbishop pulled it down during the Thirty Years War. Erosion continued man's work and today there is little but rubble left of the earlier structure atop the hill. That doesn't mean it was the end of Drachenfels. It remained a popular stop for Rhine romantics with notable visits from elites like Lord Byron. Today's visitors usually come for the picturesque Schloss Drachenburg, a neogothic castle from 1882 commissioned by Baron Stephan von Sarter. It has had numerous private owners, each leaving an eccentric twist on the castle (think potential Zeppelin landing pad, amusement park, and 1970s disco parties). It is now owned by the state of North Rhine-Westphalia and is open to the public. Its elaborate rooms and regal grounds offer stunning views of the river and valley below and on a clear day, castle visitors can see all the way to the towers of Cologne's Cathedral. The castle's modern origins (for European standards) means that little is genuinely antique about the Schloss, but it is still worth a visit. The nod to multiple early German architectural styles is a form of flattery and it is a grand example of 19th-century opulence. The people agree as the site attracts over 120,000 visitors a year. A bistro, restaurant, and shop are also available on the grounds and for those not interested in walking up the steep hill, there is a historic funicular that takes visitors from the bottom to the top. Cologne (Köln) - Koblenz route (RE8 or RB27) with a stop at Königswinter every 30 minutes. From Cologne (Köln): Take A555 to Bonn and A565 Bonn, Beuel Nord, then A59 towards Königswinter and continue on B42. From Ruhr Area: Take A3, then A59 and continue on B42 to Königswinter. From Frankfurt: Follow A3 until exit Siebengebirge/Ittenbach, then follow street to Königswinter. From Koblenz: Take B42 following the Rhine until Königswinter, or take B9 / Bonn and the Rhine Ferry to Königswinter. 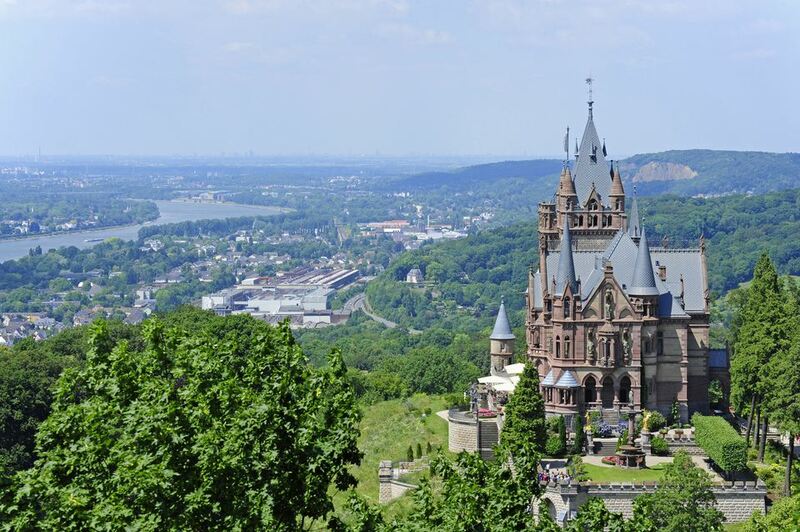 Multiple Rhine river cruises stop at Drachenfels.